December 8 is an island-wide holiday on Guam, the day when Catholics assemble at the Dulce Nombre de Maria Cathedral-Basilica to honor Guam’s patron saint, Santa Marian Kamalen. The 300-year-old Santa Marian Kamalen statue is a revered icon whose unknown origins are explained through legends that have been passed down through generations. According to one version of the legend, a fisherman from Merizo spotted the statue of the Virgin Mary on the ocean floor while he was fishing. He swam down towards the statue, but to his surprise it moved away. No matter how long he continued to swim, he could not close the distance between the statue and himself. He returned to shore and sought advice from the village priest. The priest told the fisherman to dress in his Sunday clothes and try again. He did so, and this time had no trouble reaching the statue. In another version of the legend, Santa Marian Kamalen floated into the shores of Merizo, escorted by two crabs with lit votive candles on their backs. Made of ironwood, which does not float, her arrival by way of sea was a miracle in of itself. The fisherman drew near to the statue repeatedly but it drifted away. It wasn’t until he fully clothed himself that the floating statue could be approached and touched. The fisherman presented her to his parish priest, who in turn presented it to the Spanish Governor. The statue was stored to a tool shed, in Spanish camarin and in Chamorro kamalen. Thus, she became known as Santa Maria del Camarin in Spanish, or Santa Marian Kamalen in Chamorro. The actual statue of Santa Marian Kamalen is 28 3/4” tall and weighs 48 ½ lbs. The statue is made of wood, except for her ivory face and folded hands. She has real human hair and is adorned with a gold crown. She sits in a nook perched high above the altar at the Dulce Nombre de Maria Cathedral-Basilica in Hagåtña. 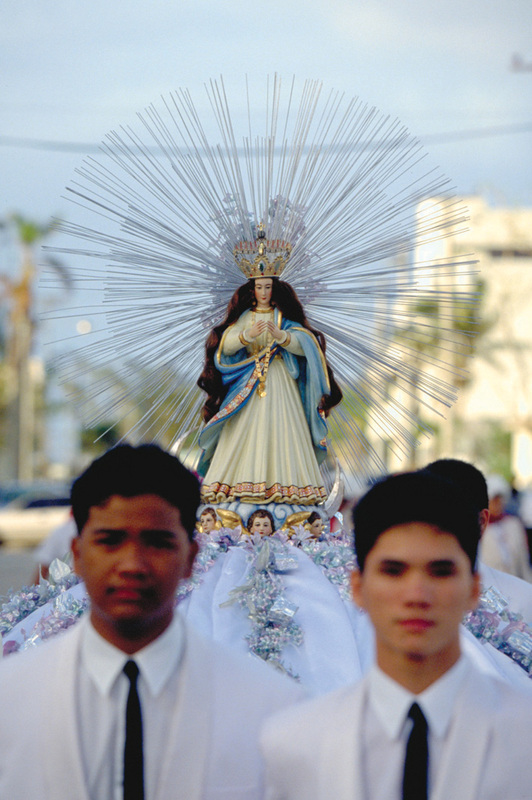 Guamanians celebrate the Feast of the Immaculate Conception every year on December 8, and thousands of Catholics from every village of the island assemble outside the Cathedral-Basilica in Hagåtña. The celebration begins with a rosary and novena, followed by a procession in which the statue of Santa Marian Kamalen is carried down and around the streets of Hagåtña, looping back to the Cathedral-Basilica. While processions are held to celebrate the patron saints of the various villages, the procession for Guam’s revered Santa Marian Kamalen held every year on December 8 is the largest by far. During your stay on Guam, visit the Dulce Nombre de Maria Cathedral-Basilica in Hagåtña to have a look at the legendary Santa Marian Kamalen, one of the most beloved icons in Guam’s history.